Lucina Reyes was born in Monterrey N.L., Mexico. At age 11, she began playing the violin. She was invited to join the newly formed Youth Orchestra in Monterrey: "Orquesta Sinfonica Juvenil De Neuvo Leon". Ms. Reyes performed with this orchestra for nearly eight years. During that time, she had the opportunity of touring with the orchestra in Mexico, the United States and Spain. 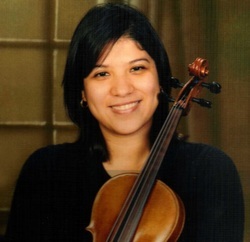 Ms. Reyes holds a Bachelor of Music degree in Violin Performance from Houston Baptist University and obtained two masters degrees from the University of Houston, a MM degree in Violin Performance from the studio of Andrzej Grabiec and a MM in Performance Pedagogy under the instruction of Fredell Lack. Aside from her studies in Houston, Ms. Reyes has attended numerous summer festivals where she studied with renowned violinists such as Kyung Sun Lee (Korea), Dmitry Berlinsky(Michigan), Vladimir Landsman(Canada), Mikhail Kopelman (New York), Jonathan Crow(Canada), and Frank Huang (Concertmaster of the Houston Symphony). As a teacher, Ms. Reyes had the privilege of being mentored by the instructors from Parker Elementary School (HISD music magnet school specializing in the Suzuki method) while still an undergraduate student. Ms. Reyes is a member of the Brazos Valley Symphony and an active violin and viola teacher in Houston and Lake Jackson. She has been an instructor at Kingwood Music School since 2006.